How do people describe the guilds they belong to. What motivated people to play World of Warcraft initially. While the first of those questions could be approached in a quantitative way by coding each 140-character response into one of a number of categories, I found that approach unsatisfying. Even in such short responses, there was more nuance than I could easily accommodate in a simple, quantitative coding scheme. For the second question, which I had not yet even attempted to analyze, I knew the number of game players saying the same thing was not the important part; the variety was important because I was interested in the underlying themes being expressed and, because I gave survey participants the space to write an essay, one or two categories was definitely not going to capture the detail. Traditional quantitative analysis tools would not easily allow me to explore and group themes dynamically either, which is why I started investigating NVivo, a qualitative analysis tool. So for this study, I am looking at mixed methods research. I will be using quantitative analysis for the demographic details and qualitative analysis for analyzing the content of free-form responses. The moral of the story, and one which David Silverman tries to get across right at the start, is that you need to choose your methods based on your data and what you want to discover. Don’t be wed to a methodology just because it is familiar to you or even necessarily just because it has always been done that way. Wikipedia. (2010) Qualitative Research, [online] web page, Wikipedia. 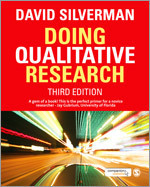 Available from: http://en.wikipedia.org/wiki/Qualitative_research (Accessed September 14, 2010).